Stick a fork in the guest bathroom. Now that I finally installed the cabinet hardware, this room is done! 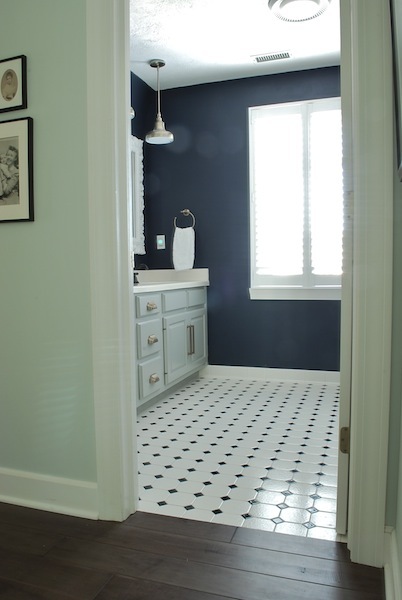 To learn more about this bathroom makeover than you ever wanted to know, check out the process here and here and here. I know you're glad to have this project done. It turned out great! 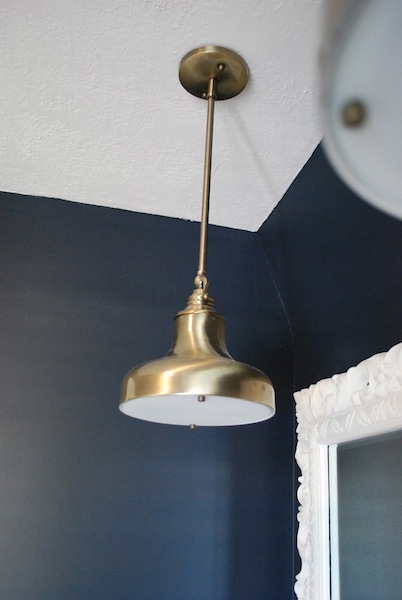 The antique brass fixtures really stand out nicely against the dark blue walls. it looks AMAZING! i love everything you did! All I can say about this project is sharp looking bathroom! Very, very sharp! Hahahaha! Your crab comment cracked me up! Love the colour in this room! 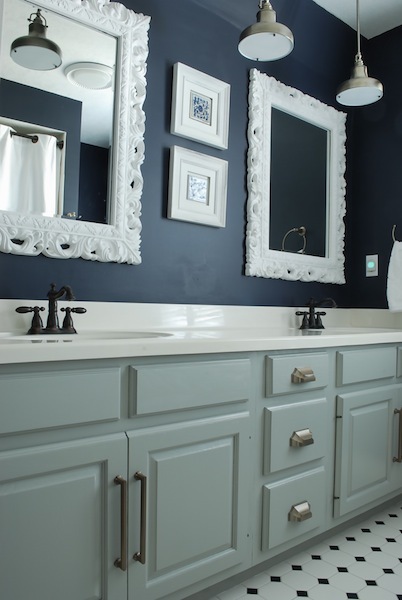 The wall color was a great choice and I love the new cabinet hardware. Beautiful! That looks incredible! I know how much work you have put into it and it shows! Fabulous! I have to tell you a "funny" crab story. I can't help it... You will laugh! We lived in Germany for several years and one day my husband's secretary was instant messaging him (mind you this is all in German) some notes and stuff and informed him that if she seemed a bit off, she was worried. She had been to the doctor and they were afraid she had "krebs". Tom (my husband) quickly looked up the word to make sure he was translating it and sure enough the first one said crabs. He freaked out thinking why has she told me this? This is too personal? His first response was "Oh my goodness! Has your boyfriend been checked?" She got all outraged and wrote back, "why would he be checked? It isn't contagious?" On further search in the translator, it also translates for cancer! My husband about died and apologized all over himself! Sorry... I had to throw that in! I think it is much funnier in person!!! LOVE everything about this bathroom! IT's just gorgeous but casual at the same time. The mirrors and the pendants are my favorite though. 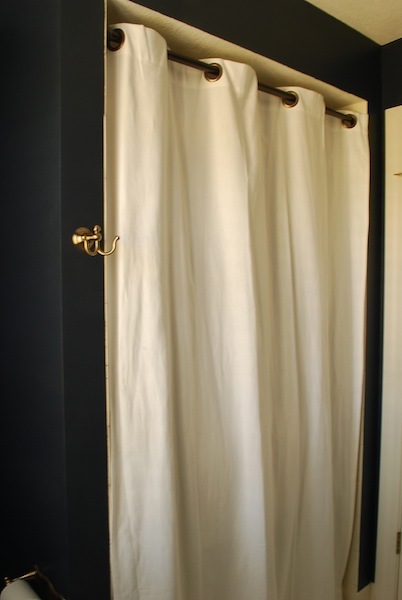 did you hang your shower curtain over a glass shower door? 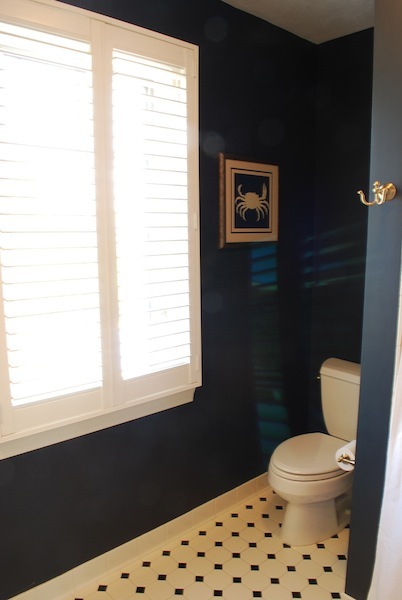 our door is in need up updating to a frameless, more contemporary one..but, until then, i have toyed with removing it completely and using a curtain...we have the same layout as your guest bath. I'm itching just looking at the crab picture. BEAUTIFUL as always! Loving the navy. You're too funny! Love how it turned out and your hardware and lighting are beautiful. Awesome update! Hope you have a wonderful week my friend. Great job! I love that it's so elegant yet simple at the same time!!!! That is beautiful! 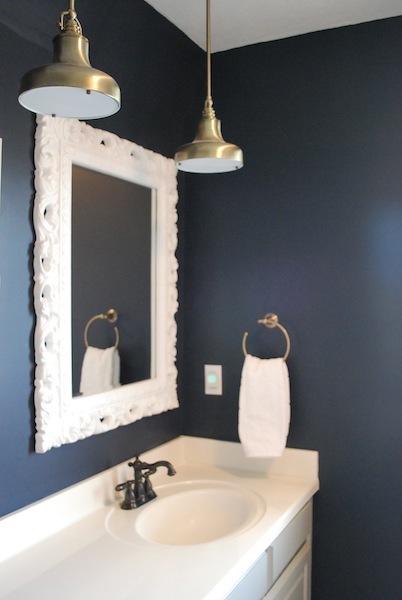 I love the dark blue color and the mirror. i love the lighting choice, and the new hardware! fabulous new space!